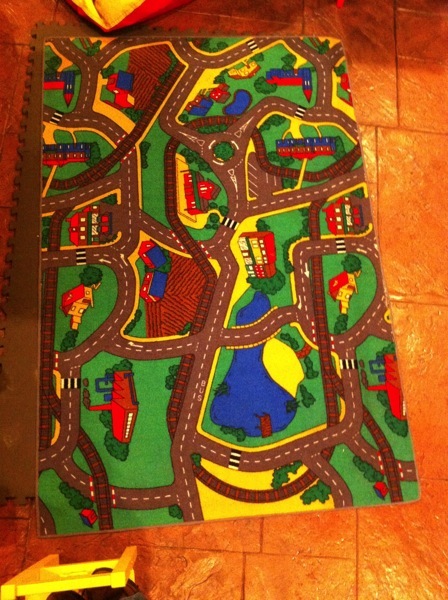 When I was young, I had a play rug with buildings and streets, and that may have, along with BusyTown, fostered my interest in transport and land use. 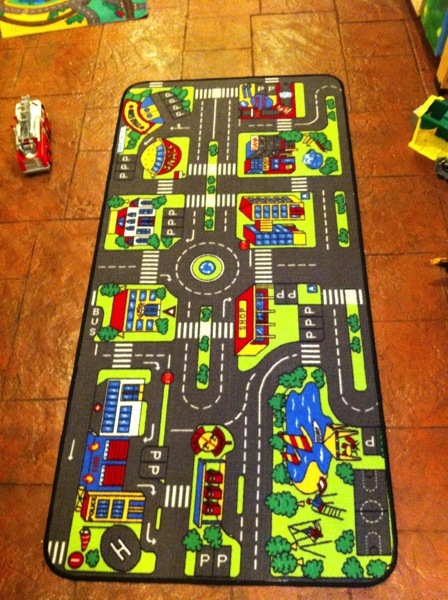 Play rugs are in some senses children’s first maps, and also their first exposure to “plan view” (though strictly these are not plan views, but some hybrid degenerate orthographic projections), how planners see the layout of places. Now, my children have two play rugs in the basement, acquired from some random Big Box retailers (Home Depot and Target), which for the purposes of this post, and in honor of Dr. Seuss, I name Rug 1 and Rug 2. While on first glance they appear to be similar play rugs made out of some artificial material that we will, in a decade or so, discover causes cancer, Rug 2 is longer and skinnier than Rug 1. Rug 1 has a number of major roads and and three railroad tracks. The roads themselves used a dashed white line to separate traffic (rather than a double-yellow line), harkening back to the days before traffic markings were standardized. There are some zebra crossings for pedestrians, and the railroads sometimes cross the road at grade, and at other times just disappear before the pavement (it is possible there is an elevation change, so it actually goes under the road, this is not clear to me though). The road has a BUS lane or BUS stop randomly placed away from any activity. The community itself has a roundabout rather than a traffic signal or stop or yield sign at one three way intersection in the northeast quadrant. The land use is bucolic and relatively low density, and highly repetitive, as it if were made from a repeating pattern that was just cut into a rug that was a bit wider than intended. There are factories in the south, houses to the north of that, with a farm. Some retail with apartments in the center, across from what appears to be a school. A gas station is at the same latitude as the school, and just to the north there are apartments in the form of a mansion. At the northernmost end of Rugville are a church and some single family homes, as well as a farm. The rug may be from Minnesota, there are two lakes in our scene, the larger of which has a beach. There are far too many roads for the demands placed on them by the local land use, but perhaps lurking off-rug is a much larger, denser development requiring all this capacity. The scene has no people or vehicles, those are presumably to be supplied by the child. Rug 2 is a much more urban setting. The town of Rugopolis is bisected by a mostly four lane arterial, which I will call Park Avenue since it has a park-like median, and we can imagine that, like Manhattan, the trains run underneath, since they are not visible at grade. Traffic control is varied here, with stop and yield signs as well as a roundabout in the center of town. There are many marked pedestrian crossings, but as with Rug 1, not all crosswalks are marked. None of the roads in Rug 2 have obvious sidewalks (or bike lanes). Rug 1 appears to have many sidewalks, but they are not uniform, and they do not have boulevards separating the walking path from the road. In the southeast quadrant there is a lake and a beach. But the lake has sailboats (the only visible vehicles) and there is a life-guard as well. The playground has a person on a swing. These are the only two visible people on the rug. There is also a basketball court in SE park. The starkest difference in the two rugs is the amount of parking provided in Rug 2, denoted by the letter “P“. While this is a lot of parking, unless the transit system is much more robust than portrayed, it is also inadequate given ITE standards of parking generation. There is only one bus stop in town. From the south, in addition to the park is a gas station, a police station, a fire station, and a hospital. The Fire station appears to be on fire (Oops). North of the park on the east side is a shopping center, a high-rise building with a skyway (though the skyway does not cross a major street), a post office, a bank, and a carwash. North of the community services on the west side of Park Avenue are a school, a (converted?) mansion with parking a snack shop, and a funeral parlor (I am guessing) appropriately called “The End”. Makers of mass-market children’s rugs think kids like to play with vehicles on networks. They especially like to play with cars. 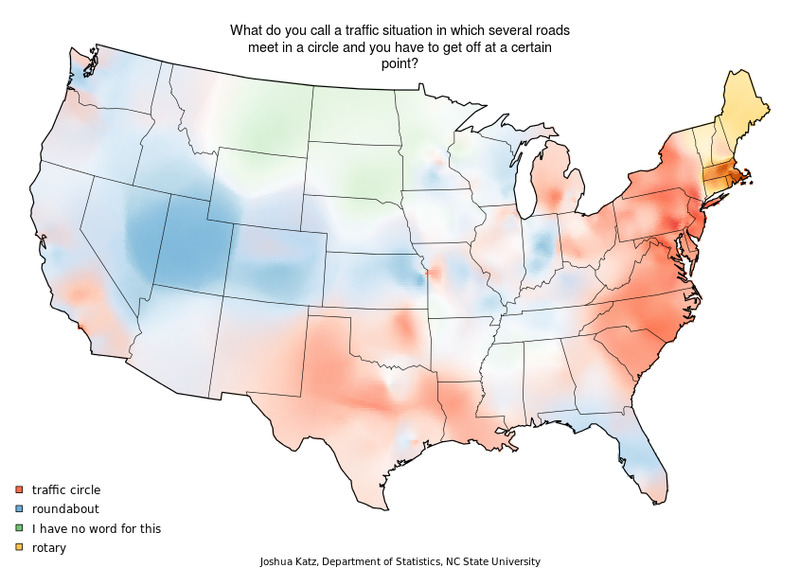 Roundabouts are more fun than traffic lights. Kids understanding of the world (or perhaps rug makers understanding of the world) is focused very much on the world of end-user consumption and action-hero type jobs (police, fire, paramedic), less so on real world of work, making things, much less the service economy. I am sure a building that said “Civil Engineering Office” would not present to kids a clear play activity, much less “Planning Office”. Free transit? A thought experiment.